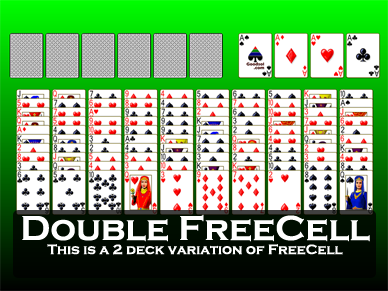 Click on the screen shot of the game FreeCell from Pretty Good Solitaire to download the 30 day free trial version. 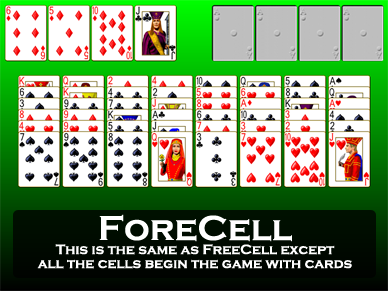 FreeCell is a popular solitaire game that is almost always winnable. 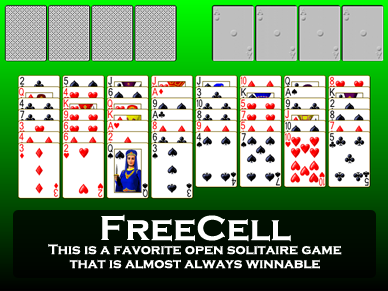 FreeCell was invented in the 80s by Paul Allfile for the PLATO educational computer system. 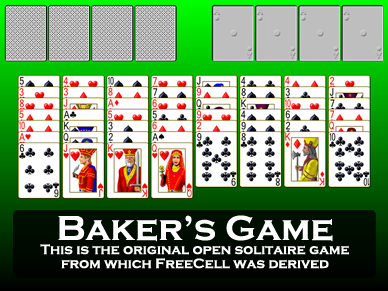 It was the first major solitaire game invented specifically for play on computers. 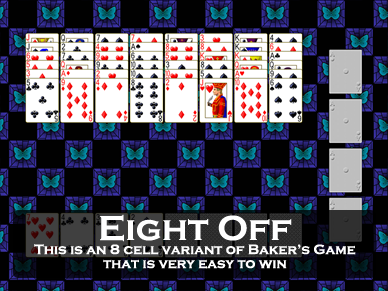 It is a simple variation of Baker's Game and is related to an older, classic game called Eight Off. My version of FreeCell in Pretty Good Solitaire or FreeCell Plus allows you to play offline, full screen, with complete undo and my unique right click quick move. It's the best way to play FreeCell! 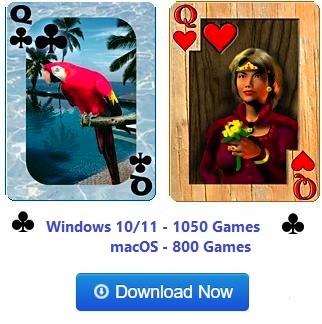 FreeCell for Windows 10 or Mac! 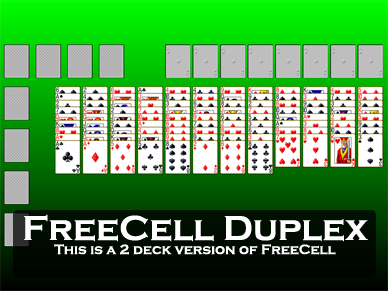 In this video I explain how to play FreeCell. Download FreeCell Now and play along! FreeCell begins by dealing out all 52 cards into eight tableau piles. The first four piles will have seven cards, the last four only six cards. All the cards are face up, which makes FreeCell an open game. Open solitaire games are usually the most interesting and give the most opportunity for skillful play and FreeCell is no exception. 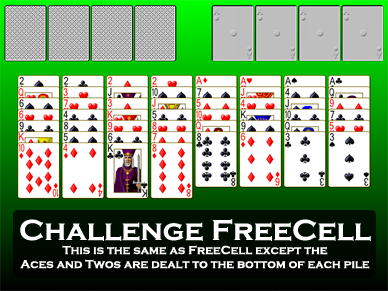 The object of FreeCell is to build 4 foundation piles up in suit from Aces to Kings. In addition to the foundations and tableau, there are four cells. Each cell is a storage place for one card. Any available card can be moved to an empty cell, and cards in the cells can be moved either back to the tableau or to the foundations. In the similar game called Baker's Game, the tableau piles are built down by suit. This makes for a challenging game. FreeCell allows building in the tableau down by alternate color, which makes for a better, more balanced game. Moving groups of cards is not strictly allowed in FreeCell. However, in Pretty Good Solitaire I allow for moving groups of cards as a shortcut. If you have all four cells empty, for example, it would be possible to move a group of five cards in sequence down by alternate color by moving the top 4 cards to the cells, then moving the 5th card, then moving the four cards back from the cells to reform the group. Since this takes forever, Pretty Good Solitaire allow you to simply move all five cards together at once. In effect, the number of empty cells determines how many cards you can move as a group. Important Tip: Try to keep the cells as empty as possible so that you can move more cards around in the tableau. Clearing a tableau pile also greatly increases the number of cards you can move as a group, since the empty pile can be used not only to store one card, but an entire group of cards. FreeCell can be won very nearly every time. Only a very few FreeCell positions are impossible to win. The best known impossible game is #11982 in the Microsoft version of FreeCell that comes with Windows. This game is the only one of the regular 32000 games that is impossible to solve. Pretty Good Solitaire uses the same game numbering system, except it goes up to over 2 billion. Only a very few of its over 2 billion starting positions are unsolvable. The known unwinnable games under one million are #11982, #146692, #186216, #455889, #495505, #512118, #517776, and #781948. If that is too much, FreeCell is also in our smaller and cheaper game FreeCell Plus. You can download the free 30 day trial version of FreeCell Plus here. Play FreeCell full screen, offline, with complete undo and game numbers compatible with the old Windows FreeCell. "One of my favorite times to play is in the evening when I'm on the phone with my Mom. She is 78, widowed for 10 years, and she enjoys telling me about her days in great detail. Pretty Good Solitare gives me something to do with my hands, and provides just the right distraction when Mom gets extra detailed. 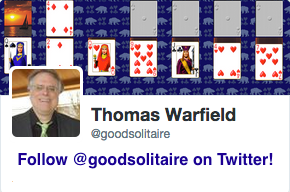 It's not an exaggeration t o say that Pretty Good Solitare helps me to be a better daughter!"